P6. Genuine Leather Biker Coat For Dogs. It is lined with matching soft alpine fleece. and has a real belt that buckles. The pouch is made of heavy blue or fuchsia denim with a color coordinated fleece lining. 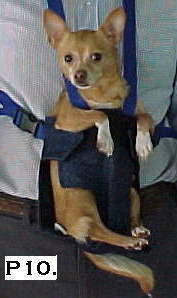 The sides of the pouch fasten with 2 inch wide velcro, so it is easy to put the dog in. There is a cute round hole in the bottom of the pouch for your dog's tail. The straps are 1 inch wide and fasten with plastic snap buckles that adjust. Mini Fits Dogs 3-4 lbs. Small Fits Dogs 5-10 lbs. Medium Fits Dogs 11-15 lbs. Large Fits Dogs 16-20 lbs.